Digital painting tutorial Bison hunt speedpainting. This video shows you how to create a speed painting of a cinematic scene of wolves hunting a bison. I spend about 30 minutes on this conceptual painting. A lot of time I will do research for the environment I want to study and paint if I have no idea what I want to paint at that moment. You can scroll down further to see step by step images with instruction. I will explore different area of the world that has extreme condition like arctic or desert. Then I will try to imagine who is there and why or what happen. This will give me more information so that I can make up some exciting story or moment to amp my visual. Once I have some vague or rough idea, I can then start to explore with shape on my canvas. Then the rest will take care of itself, I will just add the detail to the story as I go on painting. Sometimes though I will have a solid idea of what I want to paint. But sometime, I will just let the visual shapes and color guide me as I go. 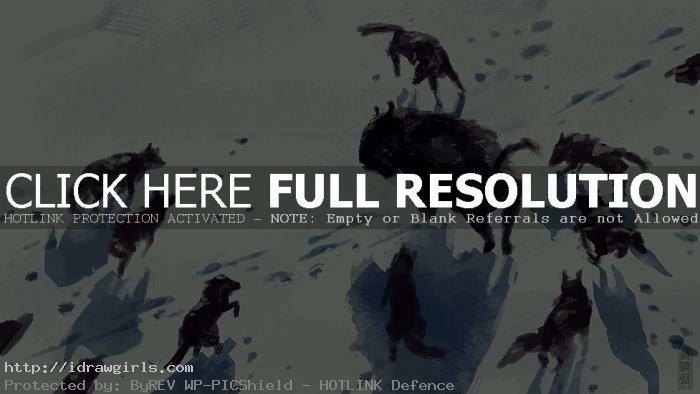 Below are step by step images of painting wolves hunting Bison.